Wander Compass provide opportunities for travelers to join an instant quick tour in Kyoto. After the tour, you will get a discount on Wander Compass's originally designed t-shirt with your memory on it. You can choose between two options.One is Japanese letters of your name, family name, or anything you want. Another is a photo from the tour. We will print the chosen design onto the t-shirt. Join our tour today and get your original T-shirt at a discounted price. 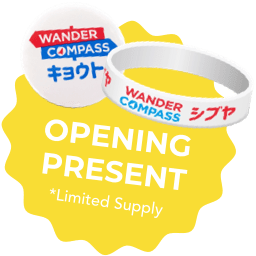 A new tourist hub, Wander Compass Kyoto, is opening on the 1st of October in front of JR Kyoto Station. Here our friendly staff will recommend tours and even plan with/for you on your demand.In addition to the consultation service, we provide money exchange, guide service, and more useful services at your convenience.The staff is all locals in Kyoto and knows the popular attractions and local spots you won't have known without visiting here. Visit us at Wander Compass Kyoto. It just makes your trip better.